Bloomy is a clean, minimal, search engine optimized (SEO) and fast loading WordPress theme. The most important factor of any theme is its loading speed. With its lightweight code, Bloomy can make your website load blazingly fast. It is a blog theme but with support for page builders like Elementor, Beaver Builder, Visual Composer, it is possible to build any kind of website. It is also RTL & translation ready. Theme is coded with speed in mind. It is lightweight theme which makes your pages load faster which further improves the ranking of your blog/website in SERP. It is possible to change font settings for most of the theme elements using built in typography options. Choose the fonts and other font properties of your choice. 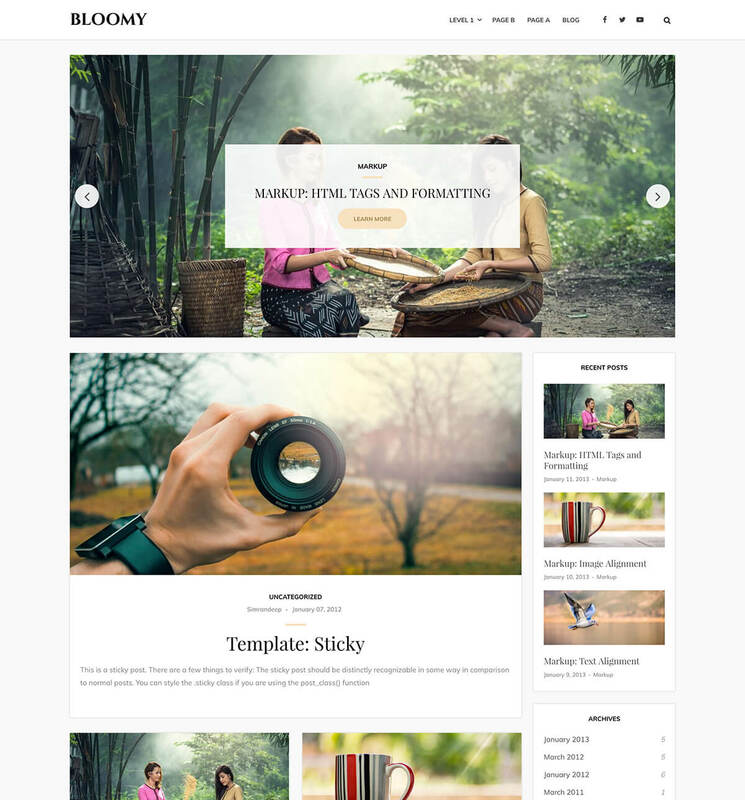 Theme offers 3 layout option for blog, archive and single posts. You can choose from left sidebar, right sidebar and no sidebar layouts. Bloomy comes with 3 different header styles for you. You can choose whichever suites you best. You can choose 1 column, 2 columns, 3 columns or 4 columns footer widgets sections with just a click. With beautifully designed posts slider, you can show featured posts of your blog/website from a selected category. Layout of theme is 100% responsive and it displays perfect on retina and high resolution displays. Bloomy is RTL and translation ready WordPress theme. You can translate it to any language of your choice and it will work perfectly.